1 BR | 1 Bath | Beautifully Decorated | Great Location! Making plans for the perfect vacation in Savannah, Georgia? Avoid the hotels and instead check out Savannah vacation rentals with Southern Belle. By booking vacation homes for rent Savannah, you can enjoy the convenience of staying in a private house with all the comforts of home and still be within walking distance of popular attractions. 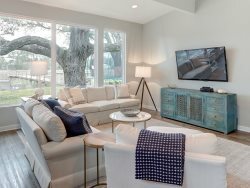 Southern Belle's Savannah GA vacation homes are all equipped with a range of conveniences like wireless Internet, cable TV, gourmet kitchen and laundry units. One of our amazing Savannah vacation rentals is Down Under Darby, located on East Huntington Street, between Lincoln and Habersham. This puts you just east of Forsyth Park, which is a can't-miss attraction in Savannah. Down Under Darby is one of our smaller vacation homes for rent Savannah, but it can still sleep a total of four guests if necessary. You'll find one bedroom and one bathroom with a full-size bed in the bedroom and then a queen-sized sleeper sofa. This could be the perfect retreat for two couples. Like all of our Savannah GA vacation homes, it includes plenty of comfortable seating, a laundry unit and a full kitchen. It also has a large patio where you can enjoy drinks or snacks outside at any time of day. Step into this Savannah vacation rentals and enjoy the open floor plan with wood floors, a sitting room with large flat-screen TV and easy access to the kitchen and dining room. The gourmet kitchen is fully outfitted with new, stainless steel appliances, a huge sink and expansive granite countertops. There are three seats available at the bar and then a cute, retro dining set nearby provides seating for two more. The wide, open look is great for socializing. The living area also features two large windows to let in the Savannah sun. In the one bedroom, you'll find a full-size bed and a large, wall-mounted flat-screen TV, plus comfortable bedding and decor in a relaxing blue. The bathroom is equipped with everything you'll need during your stay and you'll also find a stacked washer and dryer in the unit. The best part of this house might be the big, enclosed patio complete with wicker furnishing and places to set drinks. Framed by plants and set against a brick facade, it's like a miniature tropical getaway. River Street and City Market are two of Savannah's historic neighborhoods and are filled to the brim with shops, restaurants and other attractions. You may need an entire day to explore them both. If you're craving the beach and unfettered views of beautiful deep blue waters, then you'll want to take the 20 minute trip outside of Savannah to find Tybee Island. Here, you'll have the option of simply beach combing, visiting the old lighthouse, checking out the Tybee Island Marine Science Center, booking a dolphin tour or taking a meal at one of the many great restaurants. Book your Savannah vacation rentals with Southern Belle and rest assured that your comfortable, private and beautiful accommodations will be waiting for you upon arrival. Staying in vacation homes for rent Savannah gives you the opportunity to experience the city on your own terms, just like a local. Give us a call today and find out which Savannah GA vacation homes will be the perfect one for your stay. My questions and concerns about the property were answered in a polite and timely fashion. We enjoyed our stay very much. the location was convenient to a grocery store and we were able to walk to a restaurant for dinner. We enjoyed the neighborhood atmosphere. I did call your office a few times before our stay, and the phone was answered promptly each time. Members were able to answer my questions immediately and seemed very knowledgeable and pleasant. The location of the property was fantastic. It puts you in walking distance of places for breakfast (J. Christophers, Clary's), Forsyth Park and other restaurants. You are far enough from the riverfront for it to be quiet but only about a 3 minute drive to get there. We also had no issues parking on the street.